The Food and Agriculture Organization (FAO) of the UN has been using aquaponics to address the humanitarian crisis in Gaza. 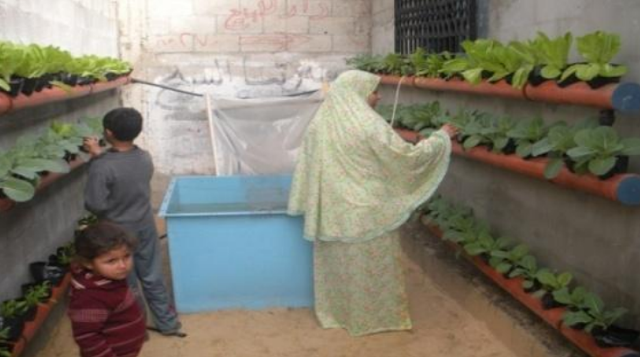 Why does Gaza need Aquaponics? Gaza’s population has been a prolonged humanitarian crisis. In 2011, 44% of people are classified as food insecure, and in rural areas this figure reaches 52%. Meanwhile, over 80% of Gaza’s inhabitants are dependent on some form of external assistance. Land available for horticulture is extremely limited in the Gaza Strip and, with the current closures and movement restrictions in place, many kinds of fresh vegetables are expensive and hard to find. Furthermore, 97% of the Gaza Strip population are urban or camp dwellers, and therefore do not have access to land. Enabling more families to produce affordable fresh produce in their own home or urban gardens therefore is a highly appropriate and effective response to the current conditions in Gaza. 119 food insecure female-headed households living in urban areas were given innovative rooftop aquaponic units. In addition, 24 units were installed in educational and community establishments.